I am really happy with this month’s LoveLula Beauty Box – it contains some wonderful products and in total it’s worth £60. That’s a great value for money for only £13.95 (monthly subscription with a free delivery) and if you haven’t subscribed yet, now it’s the best time since you can currently get a discount on your subscription, for a limited time only. Check the subscription options here. I think the LoveLula Beauty Box would make a lovely gift for green beauty fans or for those who want to transition to using more natural beauty products. I think Madara’s eye cream is definitely a highlight of this month’s box. On its own it’s worth £31 which is more than double the cost of the box so yeah, if you are not already subscribed you are definitely missing out! This natural eye cream targets fine lines, dark circles, puffiness and tired eyes. The cream is quite light and easy to absorb. You don’t need to use much of it for one application so the tube should last you for a while. The cream contains an age-defying SMART ANTIOXIDANT complex of Lichen, Moss, Fern and Alchemilla which all work together to hydrate the skin and correct fine lines and wrinkles. As with any eye cream you need to use it for a longer period of time to see some visible results (when it comes to fine lines). I’ve been using it for only five days so still early days..
Offer alert: If you like any of the products from this post, you can get 15% off on all of them for a limited time only (just remember to use the code FRIDAY at the checkout). 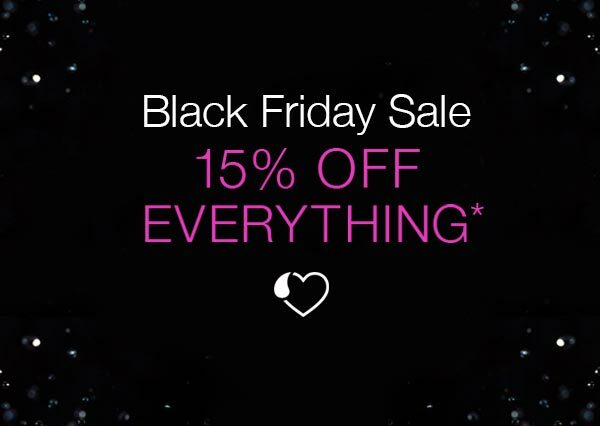 The Black Friday on LoveLula has started early so don’t miss out! Laidbare is a brand which I am really starting to love. I am a big fan of their For Richer For Porer ‘Miracle’ Mask and I’ve heard so many good things about their Pack Your Bags Lighten & Tighten Eye Cream. All their products are really affordable, including Laidbare Working 9 to 5 face cream which costs only £7.99. The cream contains extracts of rose water to calm, revitalise and soften the skin. Anti-ageing Iceland Moss helps to combat the fight against time and Gotu Kola works by stimulating collagen production. The cream is not heavy at all and very quick to absorb. This makes it great for using in the morning under makeup. I think it’s great for normal and oily/combination skin but it may not be hydrating enough for very dry skin. However, you can use it together with a facial oil to make it more effective and reduce dry patches. Inika’s organic lipstick is vegan, cruelty free and contains shea butter and jojoba oil to moisturise and protect your lips. On LoveLula website the colour (Naked Kiss) looks actually lighter than it actually is. I think if the colour of the lipstick was indeed what is showing on the website I would like it more – I prefer lipsticks with more pink in them as I think they suit me better so other Inika shades such as Pink Poppy or Honeysuckle would be better for me I think. Anyway, Naked Kiss is still not a bad colour. It’s quite neutral to start with but then as you are applying it starts to get darker and more visible. So you have a choice really – you can leave your lips with just a bit of colour or build on it if you like them to stand out more. I found this Inika lipstick doesn’t glide on easily though. It does feel a little bit hard on the lips at first but then the warmth of your lips will soften it a bit and it will be easier to apply. The box contains a sample of Eucalyptus & Peppermint Balancing Argan Shampoo and a sample of the same conditioner from The Seaweed Bath Company. I’ve already tried Eucalyptus & Peppermint Balancing Argan Shampoo previously and I love it (full review here). The smell is very refreshing and the shampoo cleans the hair well, leaving it nice and soft (there is an unscented version of this shampoo if you prefer unscented products). It’s definitely one of the best natural shampoos that I’ve ever tried. The conditioner is equally impressive – it’s amazing for detangling hair and you don’t need to use much of it. I recommend both products especially if you have normal to oily hair. This is a new product from REN and at first I didn’t know what exactly is good for and how to use it. But now I know this can be used as a primer, just before you apply your makeup. You only need a few drops of Perfect Canvas for the whole face and after applying, the skin will feel smoother and make-up ready. This serum does not contain silicones and it’s quite special in a way it contains probiotics which smooth the skin; agave extract on the other side acts as a natural filler to prime the skin. You can also use Perfect Canvas without makeup, just as a final step in your skincare routine to help your skin look better: plumper, smoother and lifted. If you are a green beauty fan and want to subscribe to LoveLula beauty box click here. It’s normally £13.95 a month, including the postage but you can currently get a discount on different subscription options. And remember, every month you will get 20% off on all the brands found in the box. What do you think of November’s LoveLula beauty box? Have you tried any of these products? Thanks for sharing such a nice selection, I may try some of this products.